Naas won the inaugural U/20 football league by defeating Maynooth in a closely fought and exciting encounter in Hawkfield. In very cold and windy conditions the teams showed plenty of football skills and determination. Naas made the early running and were o – 5 to 0 – 1 ahead after twenty minutes.Three Maynooth points gave Naas a two point half – time lead 0 – 6 to 0 – 4. Naas dominated the third quarter with two goals in three minutes. After sixteen minutes Naas had taken a ten point advantage leading 2 – 9 to 0 – 5. Maynooth piled on the pressure in the last quarter and scored four unanswered points which put a better complexion on the scoreline. Maynooth opened the scoring with a Danny O’ Sullivan point after a minute. Naas replied with Ciaran Doyle points and one each from Shane Ryan and Ultan McAleece. Three points in a row for Maynooth from eoin Donnellan(2) and Kevin Dunne (1) put them one behind at 0 – 5 to 0 – 4 for Naas. A Ciaran Doyle point on the stroke of half-time gave Naas a two point interval lead. A Ciaran Doyle point at the start of the second half was matched by a similar score from danny O’Sullivan. In between the Naas goalkeeper David Morrissey made a great save. Naas scored the first of their goals after ten minutes when Shane Ryan found the net. Then Naas centre – forward Dallen Gallagher with a goal and two points in five mkinutes. Naas led 2 – 9 to 0 – 5. Maynooth fought back in the last ten minutes and scored four unanswered points from Eoin Donnellan(3) and Danny o’Sullivan(1). 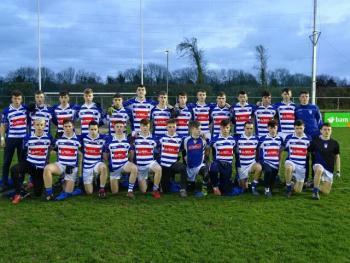 Naas: David Morrissey, David Shaw, Conor McCarthy, Joe Delaney, Sean Cullen, Cathal Dowling, Adam Cronin, Ben Blackbourne(Capt. ), Cathal Daly, Darragh Merriman, Dallan Gallagher, Ultan McAlleece, Mikey Kenny, Shane Ryan, Ciaran Doyle. Thanks to Liam McManus for the report and photos.